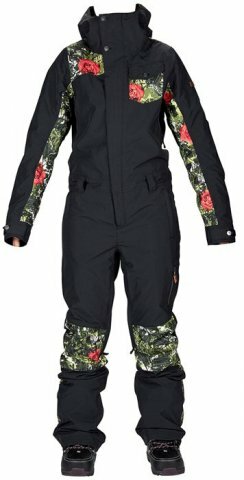 The Nikita Madrona One Piece is definitaly a fun good looking onsie, I thought it had a great fit, and it had a very nice compatability with the hood and helmet. It is insulated with 40g so should keep you warm on pretty cold days, and it has a 15k waterproof rating. I loved the fit and feel of this one piece, and it has a decent amount of warmth and water protection. This might be a good fit for someone who likes riding on pow days and does some storm riding, but maybe not a great fit if you see a lot of really wet snow conditions. We try to get as many images of the Nikita Madrona One Piece, but forgive us if they're not all there.